Costner and Harrelson drive this stylish period piece that honours the unsung heroes who tracked down Bonnie & Clyde. Originally conceived as a 2005 project that would have reunited Butch & Sundance themselves, Robert Redford and the late Paul Newman, the production - from the writer of Young Guns and Young Guns II - eventually landed in the hands of Netflix, with The Alamo director John Lee Hancock securing some fine replacements for Redford and Newman in Kevin Costner and Woody Harrelson. Whilst Netflix continues to be something of a question mark label for modern productions, rather than the mark of quality that they would have preferred, several of their 2019 features have at least felt like proper movies that could have had a theatrical release (Triple Frontier, Velvet Buzzsaw, High Flying Bird), rather than just obvious Netflix fare. Hancock's slick and stylish cops-and-robbers flick (complete with stunning Dolby Vision and even Dolby Atmos at play) enjoys its period trappings, and makes the most of its grumpy old men leads and enjoys the alternate viewpoint reframing of a familiar tale. Celebrated outlaws Bonnie & Clyde are idolised by the public who see them the same way they envisage Robin Hood - robbing from the dastardly banks and doing no harm. But the dead bodies they leave in their wake tell a different story, and the two year killing spree that they have been on needs to come to an end, seeing the Governor of Texas dispatch two retired Texas Rangers on one last manhunt. A frequently sombre, contemplative gem, The Highwaymen embraces its purposefully paced tale of old war dogs drawn out of retirement for one last hunt, following them on what is basically an extended road trip, as they try to track down the elusive criminals, always remaining one step behind - but still frequently one step ahead of the Feds that have been on the trail for years. 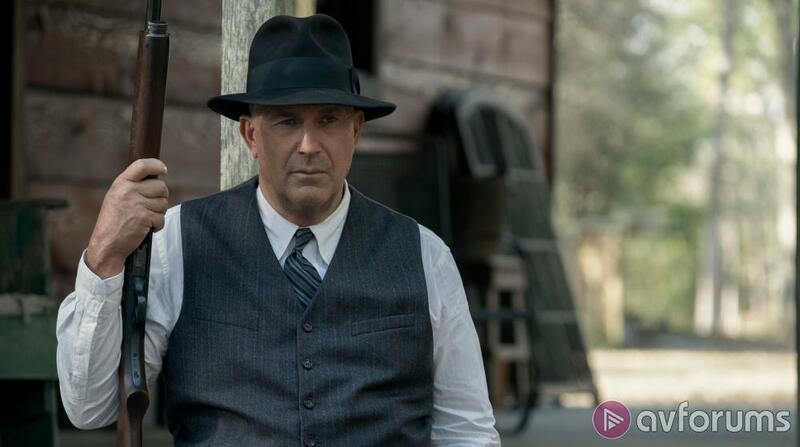 Hancock doesn't try to glamorise the affair, attempting to craft a picture that is arguably the polar opposite of the romanticised Bonnie & Clyde tales of old (think: Beatty and Dunaway), enjoying the rich period setting replete with classic cars and guns, and weathered suits and hats. It's Unforgiven for these Texas Rangers; the last of the old school gunslingers who may just be the only ones that can take down the deadly duo. Costner is perfectly cast in the lead - you could almost see Redford and Newman vying for the limelight, but here there's no question who is in charge, and the veteran actor (who has brought such much-needed gravitas to everything from Man of Steel to Hidden Figures to Molly's Game) commands the screen with a perfected gruff tone and grizzly demeanour. Harrelson (who has enjoyed his own choice parts of late, in the likes of Three Billboards and War for the Planet of the Apes) makes for a strong foil, quiet and supportive, and with enough banter to play off Costner's stoic lead without changing the tone of the piece. Cleverly, in a movie that revolves around Bonnie & Clyde, you barely get to see the pair at all - keeping focus on these old hunters as they try to pick up the scent, eliciting some tension from close calls, but ultimately building to that final confrontation with no overt fanfare, and instead pays respectful tribute to those unsung heroes whose story was never really previously told. It's a small piece, rich in texture and period trappings and resting firmly on the shoulders of its leads - hardly a heavyweight player but a warm old Texas swansong nonetheless. Write your The Highwaymen Movie review.